The hard corals (Class Anthozoa, Order Scleractinia) are among the most intensely studied marine invertebrates in the world today, due to their essential role in the formation and maintenance of coral reefs, and the threats to this role presented by human impact and global climate change. Through the process of laying down a skeleton of calcium carbonate and interaction with the symbiotic dinoflagellates that enhance this process, corals have built the present fabric of the GBR over some 6000 to 8000 years and previous reef formations over many millennia, as the carbonate structures of the Queensland continental shelf and Coral Sea testify. Like trees in the forest, living corals also provide the three dimensional structure in and around which the other creatures of the reef spend their lives. Their health is vital to the well-being of innumerable organisms and ultimately to the continued existence of the GBR itself. Hard corals, like other members of the Class Antho-zoa, are coelenterate animals that have a life cycle involving a short larval stage and a long polyp phase. The polyp has the ability to lay down an external skeleton by the activity of specialised cells located within the external tissue layer (the 'calicoblastic ectoderm') at its base. 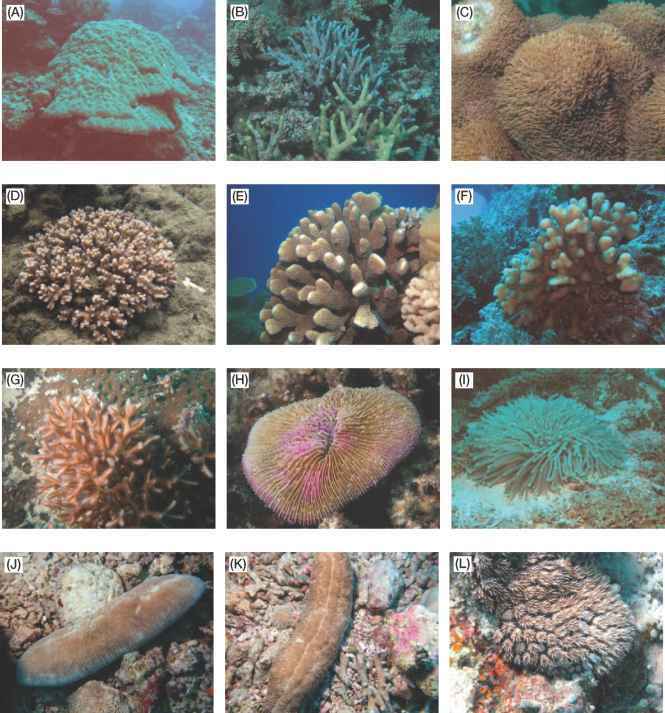 Although about half the members of the Order Scleractinia throughout the world occur as single polyps, the majority of those on coral reefs occur as colonies of interconnected polyps produced by growth and division from an original single polyp. The presence of symbiotic dinoflagellates (Symbiodyn-dium or 'xoozanthellae') in the tissues of these colonies enhances the ability of the polyps to produce skeleton, and these colonial, rapid-growing corals are known as the 'hermatypic' 'zooxanthellate', or 'reef-building' corals. As explained in Chapter 8, hermatypic corals have a dependency on the conditions suitable to their symbionts and the carbonate accretion process, and are thus limited mostly to the tropical and subtropical regions of the world and mostly to depths of less than 40 m. It is important to also note that azooxanthellate corals (those without zooxanthellae) occur in great diversity right around Australia (more than 250 species recorded to date), especially at depths greater than 40 m.
added between the preceding cycles. 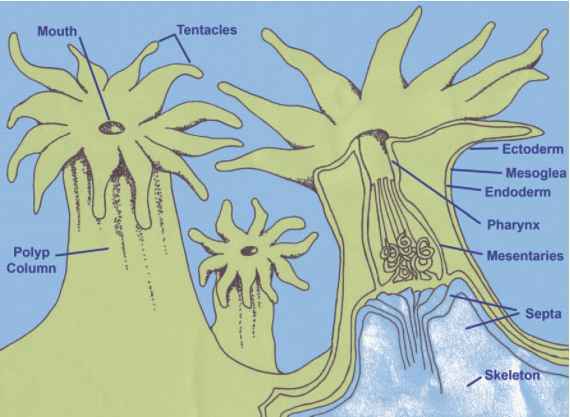 The oral disc bears a round or oval mouth without syphonoglyphs (the flagellated furrows found in anemones and zoan-thids), and this leads to a pharynx and the paired mesenteries, which may be complete or incomplete (reaching or not reaching the pharynx at their upper limit). In the process of replicating polyps to form a colony, division may occur either within the polyp (as evidenced by the presence of dividing corallites on the surface of the coral) or external to the polyp. When division is incomplete, corallites may exist in continuous connection (as in the brain corals) but little is known about the actual form of polyps when wall structures are combined. In general, the coral colony can be thought of as the sum of its polyps, with processes such as feeding and gonad formation being performed in individual polyps and contributing to the nutrition and sexual propagation of the colony.